❤️ Please install the manufacture APP "Annhome" first. The APP is FREE! You can download it from Apple Store / Google Play or through scanning two-dimensional code in the USER MANUAL. ❤️ Only support 2.4 G WiFi network. ❤️ Support timer & countdown function. Through the APP installed in your phone, you can individually schedule timer and countdown setting for the 3 outlets anytime & anywhere. 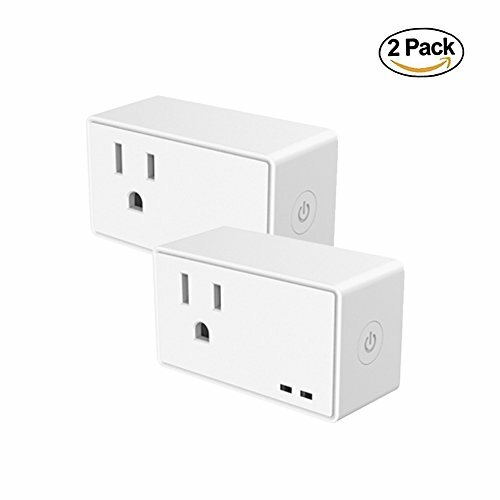 WORKS WITH ALEXA AND GOOGLE HOME - The electrical smart plug outlet can be voice controlled by Alexa and Google Assistant. You can control your lights and appliances with your voice. APP REMOTE CONTROL - The wifi plug also can be controlled by the APP "Annhome" anytime and anywhere. The APP is FREE. You can download the APP from Apple Store or Google Play. SET SCHEDULES AND TIMER - You can schedule the smart plug automatically to turn on / off the electronic devices. The countdown function is supported. EASY TO INSTALL - No hub required. The smart plug connects with internet through 2.4GHz WI-FI. Just plug it into an outlet, connect a device to the mini smart plug, and wireless control home appliances whenever and wherever. GOOD QUALITY & SATISFIED WARRANTY - The wifi smart plugs have achieved FCC, ETL and ROSH. Comes with 30 days no-questions-asked return policy, 1-year manufacturer's warranty and our lifetime friendly customer service.